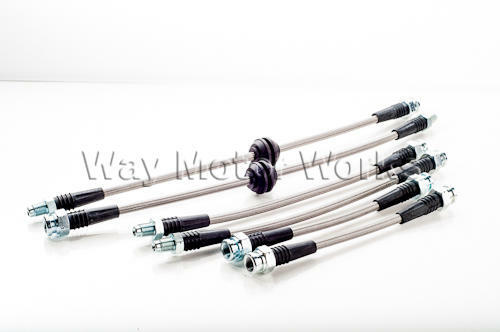 WMW Fiat 500 and Abarth Stainless Steel Brake Line kit. This is a 6 line kit to replace all the rubber flexible lines with stainless steel lines. Why do you need stainless lines? 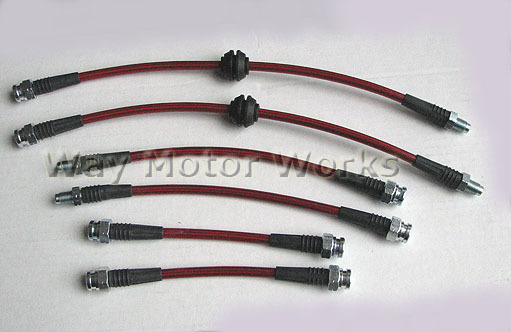 Well stainless steel brake lines have less flex, and are more resistant to damage. With them having less flex you will get better brake feel and reaction. Kit comes with 6 lines. One for each caliper, and 2 that go from the hard brake lines on the body to the hard lines on the rear subframe. Avail in Red or Clear coating.